Thursday March 10th 1892 It was a cold windy day. We could not keep even comfortable in the house. I sewed some on my quilt. Friday March 11th 1892 Weather a little better. We took the carpet up in the room the medical students left yesterday and Josie got the floor cleaned before dinner. Will and Leonard scraped the wall in the afternoon. Mother and I began to make our new rag carpet. The girls were over. Josie was sent for this afternoon as her Mother is sick. 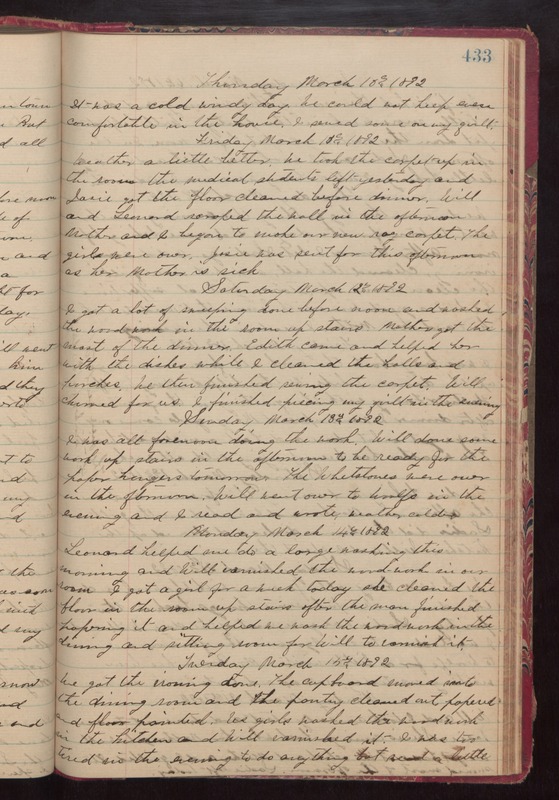 Saturday March 12th 1892 I got a lot of sweeping done before noon and washed the wood work in the room up stairs. Mother got the most of the dinner. Edith came and helped her with the dishes while I cleaned the halls and porches. We then finished piecing my quilt in the evening. Sunday March 18th 1892 I was all forenoon doing the work. Will done some work up stairs in the afternoon to be ready for the paper hangers tomorrow. The Whetstones were over in the afternoon. Will went over to Woolfs in the evening and I read and wrote. weather colder. Monday March 14th 1892 Leonard helped me do a large washing this morning and Will varnished the wood work in our room. I got a girl for a week today. she cleaned the floor in the room up stairs after the man finished papering it and helped me wash the wood work in the dinning and sitting room for Will to varnish it. Tuesday March 15th 1892 We got the ironing done. The cupboard moved into the dining room and the pantry cleaned out, papered and floor painted. Us girls washed the wood work in the kitchen and Will varnihsed it. I was too tired in the evening to do anything but read a little.